Where is winter? Love it or hate it, this has been a tame start to Winter and this month’s Beyond The Forecast looks at why we haven’t seen Old Man Winter and some thoughts on when he might arrive (assuming he hasn’t by the time you pick up this issue of Up Portland.). El Nino has been the biggest factor behind the lame start to winter. El Nino occurs when the waters off the Pacific coast of South America near the Equator get unusually warm. This causes a massive chain reaction of events that leads to wacky weather all across the globe. Here in Maine, the most common side effects of El Nino are warmer and drier conditions in the Winter. How does warm water near Peru prevent Arctic outbreaks in Maine? Read on and stay with me here. El Nino acts to strengthen existing semi-permanent circulations over the Pacific. High pressure areas become larger and stronger, and low pressure areas fiercer and more powerful. 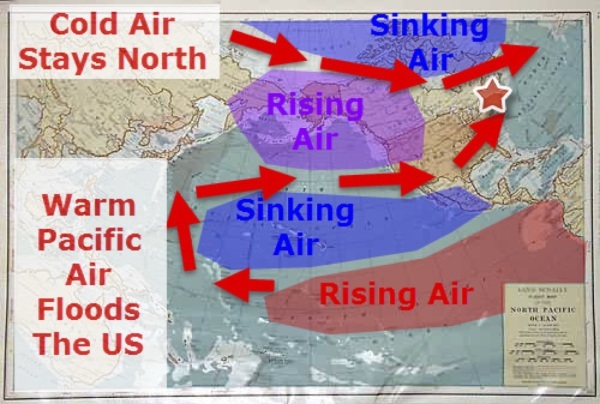 The extra warm tropical waters cause more air to rise which drives a series of events that results in a powerful low pressure area near Alaska and a powerful high pressure area north of Hawaii. In the Northern Hemisphere, air moves clockwise around high pressure and counterclockwise around low pressure. As a result, there is a strong band of westerly winds in the North Pacific that blasts warm moist air into the western U.S. These westerlies are always there and they vary in strength and exact location on a day-to-day basis (sometimes Alaska gets the storms, sometimes Washington, sometimes California and so on) but El Nino makes them extremely strong. These westerlies are so strong that they will often blast right through the west and continue to flood the rest of the country — including Maine — with mild air. But El Nino isn’t the only factor contributing to the balmy conditions as I write this in late December. The other main culprit has been the strong Polar Vortex. Yes, the Polar Vortex is extremely strong right now and that is bottling up a lot of the cold air way up north. The reason for this lies in centrifugal force. The cold dense air that lurks near the poles desperately wants to smash southward in a giant fury of wintry awesomeness but the winds that encircle the poles (at higher altitudes) keep the cold air spinning so fast it stays up north. Think of the classic spinning top. The heavy wood top desperately wants gravity to take it to the ground but it’s spinning so fast that the whole top can balance on a single point leaving the rest of the top suspended in the air. When the Polar Vortex weakens, much like when a spinning top slows down, the cold air can come surging south. That hasn’t happened yet. Basically, El Nino contributes to a pattern where mild Pacific air floods the country and the Polar Vortex is spinning so fast that no cold air can break free to come south. How can we “fix” this series of unfortunate events for those of us who could really use some good conditions for Winter outdoor activities or those who just love Winter? El Nino’s mighty fortress is slowly crumbling as various forces undermine the pool of warm water off Peru. Eventually, other atmospheric forces will be able to exert their normal influences over our weather and that change is in process as I write this. As for the Polar Vortex? That’s more complicated. Several events have to line up for the polar vortex to weaken enough to allow for true Arctic air to blast south. The best weakener of the Polar Vortex is known as a SSWE (Sudden Stratospheric Warming Event) which basically throws tons of energy on one side of the Polar Vortex which throws it awry enough to allow Arctic air to spill south. As of now, there’s not much to indicate that there is a strong SSWE coming. water temperatures off the coast (leading to a negative NAO). All that to say, change is coming. 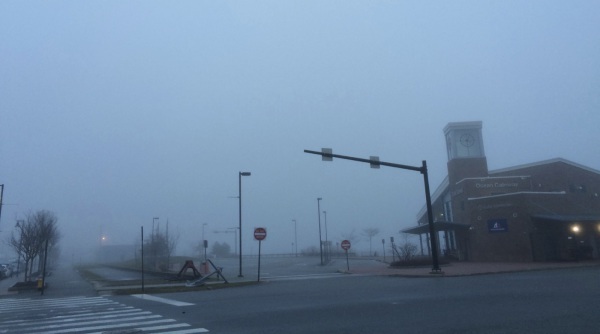 That doesn’t mean however that in one fell swoop we’ll go from shorts and a t-shirt on Christmas Day (or the dense fog, seen below on Christmas Eve) to raging blizzards and subzero temps by New Year’s. Change will be gradual here. Air moving down from Canada is slowly getting colder and colder with each passing front. Eventually that cold air will be enough to support cold rains instead of mild rains and eventually snow will be able to survive all the way to the surface. Rest assured, Winter will come as it always does in Maine but certainly don’t expect anything like last year. Keep in mind though, the first storm in last year’s epic snow blitz of awesomeness arrived on 24th January following record-setting Christmas temps in the 50’s. Just because Santa has to change out his snow skis for water skis doesn’t mean Winter is canceled, so do not let this year’s (again) record-breaking Christmas Day high of 62 make you put away that board, those snow skis or that pair of Bean Boots.